Before the organization of Nebraska Territory in 1854, missions were established among the Indian tribes of this area. In 1850, Rev. 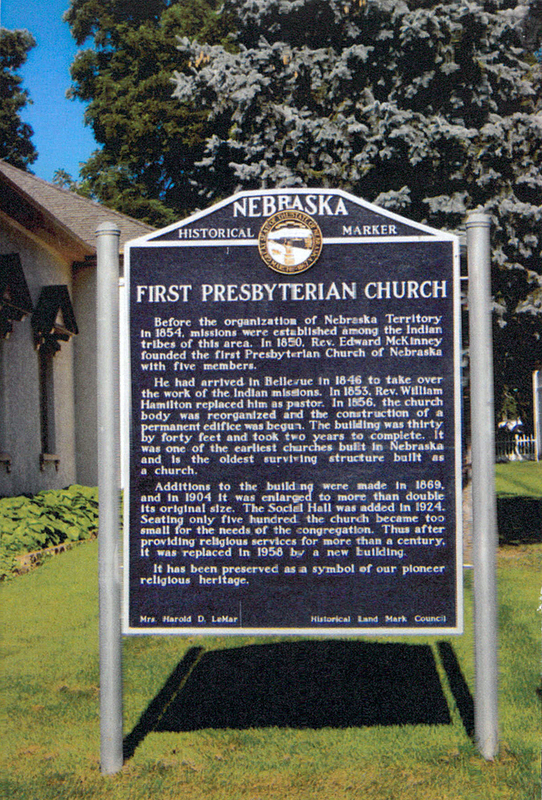 Edward McKinney founded the first Presbyterian Church of Nebraska with five members. He had arrived in Bellevue in 1846 to take over the work of the Indian missions. In 1853, Rev. William Hamilton replaced him as pastor. In 1856, the church body was reorganized and the construction of a permanent edifice was begun. The building was thirty by forty feet and took two years to complete. It was one of the earliest churches built in Nebraska and is the oldest surviving structure built as a church. Additions to the building were made in 1869, and in 1904 it was enlarged to more than double its original size. The Social Hall was added in 1924. Seating only five hundred, the church became too small for the needs of the congregation. Thus after providing religious services for more than a century, it was replaced in 1958 by a new building. It has been preserved as a symbol of our pioneer religious heritage. “First Presbyterian Church,” Explore Nebraska History, accessed April 19, 2019, https://mynehistory.com/items/show/445.